…Whilst fundamentally, I still believe it’s cheating and doesn’t test your kitchen skills to the limit, the packet cake mix may have introduced a whole new generation of kids (and big kids) to the joys of placing ingredients in an oven, waiting an hour and watching a magical dish appear. Not everyone is lucky enough to have a mum or grandma or dad or granddad who can pass on their cooking and baking skills. Everyone has to start somewhere. 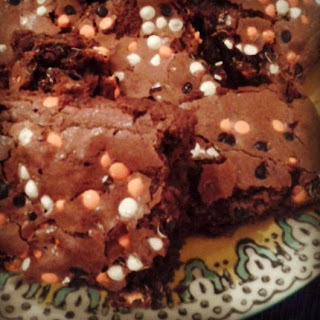 So, putting my morals aside, off I trotted to the kitchen with my Pillsbury Funfetti Brownie Mix, gifted to me by Mr WhatClaireBaked’s Mum. I apologise for the delay in writing this. 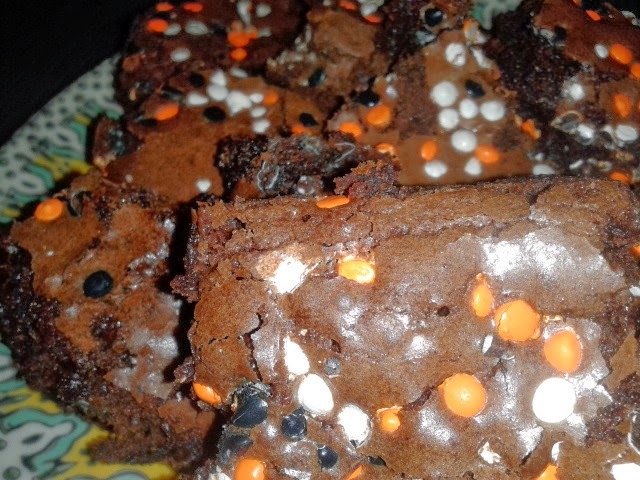 The range was designed for Halloween, but as I only returned to the UK at the end of October, baking was delayed and these became Bonfire Brownies instead. The whole process was ridiculously simple. Oven on at 180◦c, grease an ovenproof glass dish. 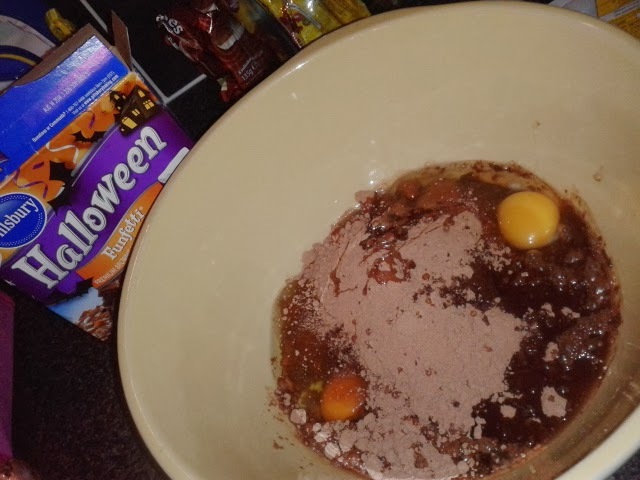 Tip the packet ingredients into a bowl. Add sunflower oil, 2 eggs and a little water. Mix 50 strokes and pour into the dish. Take the packet of sugar sprinkle topping (may have made MrWhatClaireBaked hyper… all part of the fun) and sprinkle over the mix. Door open, in oven, shut door, bake for around 50 minutes. So there we have it. 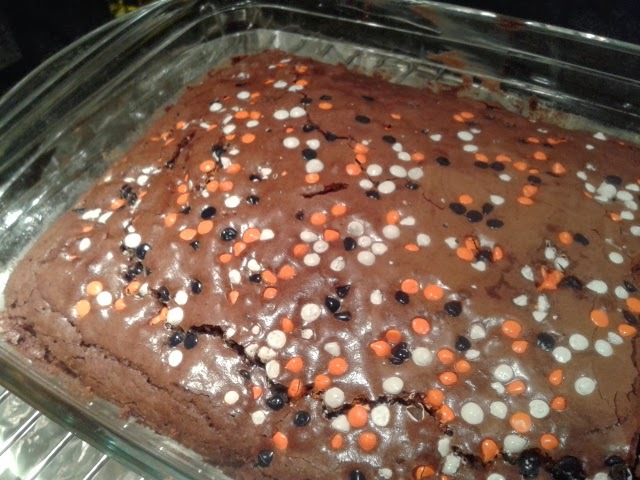 Enough brownies to feed the 500, mission completed in around an hour and a house that smelt like chocolate. All in all: a success. Spot the crunchy top and gooey centre! 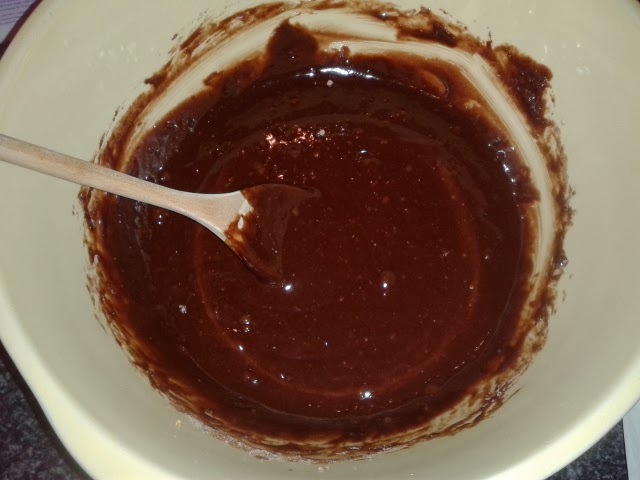 So, spare a thought for the person who says: “Oh, it was a packet mix.” Yes, it may not be a Mary Berry special. Yes, you may not be challenging your inner Paul Hollywood. But, if it’s got that person baking and into the kitchen, surely that’s a good thing? Being able to create something from nothing instils a little confidence in that person. Who knows, it might just be the starting point for a Great British Bake Off application.